In Newington alone, there are over twenty pizza restaurants to choose from. If you are looking to order on a Friday or Saturday night or feel the need for pizza in the drag of the work week, you might feel overwhelmed by your options. Since 2011, Stretch’s Pizza has been our go-to place but we never got around to reviewing them until now. Here was our experience. Atmosphere: 8/10-When you stop by the restaurant, you will immediately notice the open kitchen area. Many pizza and Italian restaurants such as Frank Pepe Pizzeria and Bertucci’s have originated and adopted this style. We personally enjoy it because it allows us to see the owners and employees hard at work. You can also smell the pizza from the plaza. There is seating in the back of the restaurant as well as the patio, but it’s not immediately noticeable. Still, the area is nicely painted and has a couple of paintings to contribute to the ambiance. Service: 8/10-Stretch’s Pizza is open at strange hours during the week, so you have to often call or stop by to see when they are open. For some, this can be a bit concerning but during a normal work week, they are open for at least 4 of those business days. When they open, it is important to ask how long the wait will be because they are in popular demand. The owners and employees are friendly and try their best with what few employees they have to meet their deadlines. Honestly, because they are so dedicated to their craft, it is worth the wait for us. We often call during the 4 o’clock hour for five because it’s not too bad. If you are just stopping by for a slice, these are ready in five minutes or less! Catering: 5/5- Catering is a new category we will use when it is applicable to our experience. We are differentiating the catering category from the service category because it is a specialty service. In the Fall of 2015, we needed several large pizzas and drinks for our Halloween pizza to feed around 20 guests. We placed our order to Stretch’s a couple of hours in advance and they did not disappoint. The pizzas were hot and ready to go by the time of the party. The guests commented positively on the size and quality of the pizza as well as the generous helping of toppings. Price/Selection: 9.5/10- Pizza restaurants are becoming more expensive these days and if you are on a budget, it can be difficult even ordering for a family of two. Stretch’s prices are more than reasonable! For a large pizza (these are large) with one or two toppings, you are going to spend under $20. Specialty pizzas cost around $20-$21. Large specialty pizzas at Joey Garlic’s, though delicious, can run up to $23.99. Pizza by slice is under $3. Stretch’s also offers calzones, grinders, stromboli and pasta. 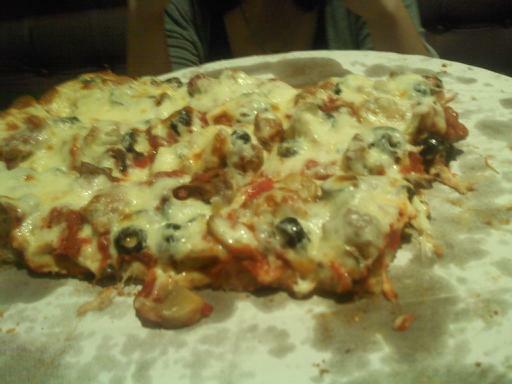 Taste: 9.5/10-This is what Stretch’s is worth waiting for-a large, savory pizza that is plentiful in toppings. According to an article for Time Magazine titled “Why Does Pizza Taste So Delicious? Allow Science to Explain,” the best pizza uses mozzarella that “melts, bubbles and browns better than any other varieties” and has the perfect “chemistry that goes into everything from dough to sauce to toppings.” Stretch’s pizza meets that criteria because when we bit into each slice, the chemistry of the ingredients were in harmony with our taste buds. While that may sound a bit cheesy (terrible pun), we also know what it’s like to bite into a terrible pizza in which the ingredients are out of sync and it is too doughy or too burnt. Our pizzas had none of these difficulties. In a nutshell: 40/45-While the restaurant does have odd hours and can be a wait on Friday and Saturday nights, their dedication and quality to craftsmanship has always been worth waiting for. If you live in the Newington area or are stopping by, this is the pizza place of the 20+ that we recommend. 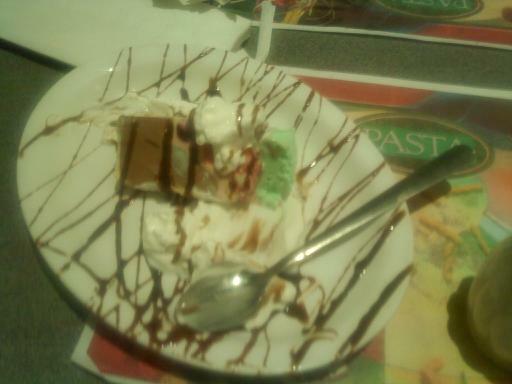 We dared to try Italian cuisine via Groupon again to kick off the new year. Groupon provided us with a few Italian cuisine options, but Procaccini’s stood out the most due to its unique chef logo and welcoming name. Since 1969, Procaccini’s has serviced the East Hartford area. This fact intrigued us. We expected a family-run restaurant with old fashioned service and traditional values. We were a little surprised by the mixed reviews on Urbanspoon. One user wrote, “We are originally from East Hartford – and have never been able to find a better pizza anywhere!” Another user complained that “…the Waitress did not attend to us being in her section and would not bring us additional seasoned bread after sitting 20 minutes.” With the opposing reviews in mind, it was time to put Procaccini’s to the test! Atmosphere: 9/10- When we walked into Procaccini’s,we noticed the eye-catching decor on the walls. We enjoyed seeing a painted cutout of the Procaccini’s chef on the wall and a beautiful painting of Venice near the kitchen. 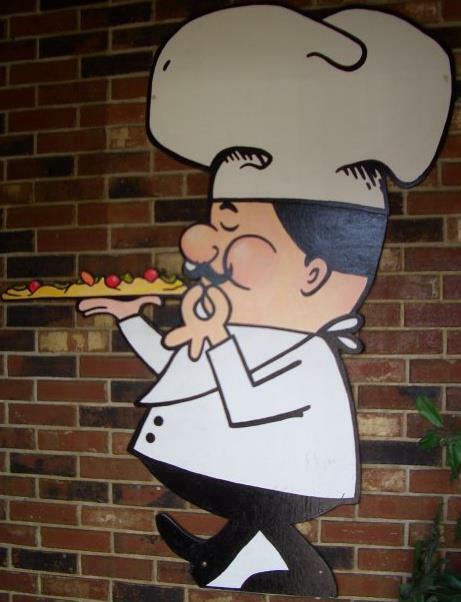 Christina commented that the chef reminded her of Little Caesar’s “Pizza, Pizza” mascot that sports the same name because of its cuteness and likability. Procaccini’s has the necessary eye candy to elate its customers before seating. We were also intrigued by the number of customers in the restaurant. 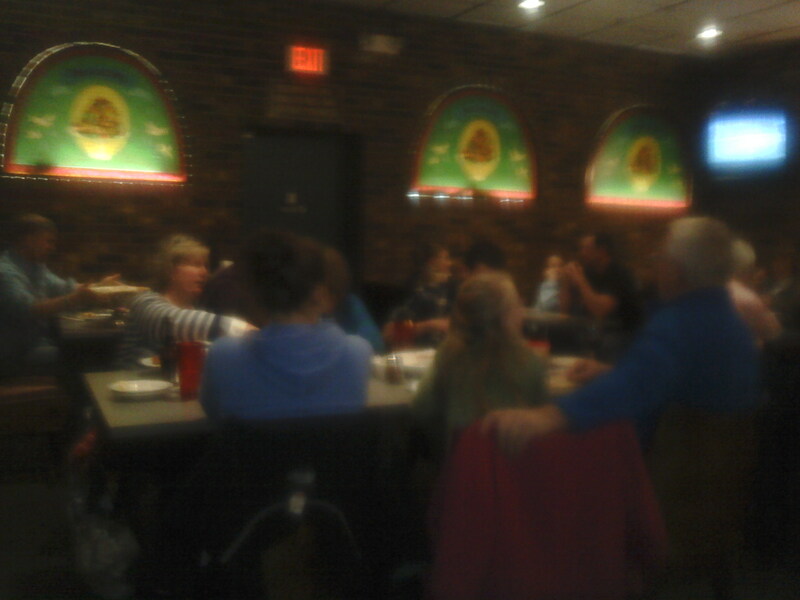 By 6 pm, Procaccini’s was filled with hungry families. Service: 7/10-We found our host and waitress friendly. They tried their best to bring food out in a timely fashion. Unfortunately, Procaccini’s is understaffed on a busy night and barely able to handle the pressure. We didn’t wait long for our appetizers, but when the restaurant started to fill, we waited quite awhile for entrees, dessert and check. Procaccini’s needs more employees. Price/Selection: 8/10-From burgers to pizza, Procaccini’s has a diverse selection of menu items. You’ll find plenty of soups, salads, pastas, pizzas and desserts. If you’re looking to order burgers or grinders, you’ll spend on average $10-13. Pasta averages $12-17 and pizza ranges from $7-26 depending on the size. You might spend more than you expect, but the prices match the portion size. You will receive plenty to eat and plenty to take home. If you’re reading this in early January 2013, take advantage of the Groupon deal we provided in the link at the top of the page. If you spend $15, you’ll receive $30 worth of food. This is a standard Groupon Deal. Taste/Composition: 8/10-We added composition to this category because how a dish looks will influence the way the customers reflects on his or her experience. Procaccini’s composition differs from traditional Italian cuisine. Most notably, they layer their pizza toppings and serve spumoni without a shell. We weren’t sure what to make of it, but enjoyed our savory dishes. In a nutshell: 32/40-Procaccini’s Italian Family Restaurant is a restaurant with history and potential to make even more history. We largely enjoyed the atmosphere and the diverse selection. Procaccini’s has the makings of a solid Italian restaurant and people see this potential. We cannot stress enough that this restaurant needs more employees. A larger staff would help speed up service on those busy weekend nights. 1. The onion soup-Procaccini’s offers a delicious onion soup topped with mozzarella cheese. 2. The layered pizza-We found the style a bit unusual, but you might enjoy the toppings layered inside the pizza. 3. The atmosphere-Procaccini’s unique logo and beautiful painting will catch your eye when you walk in. 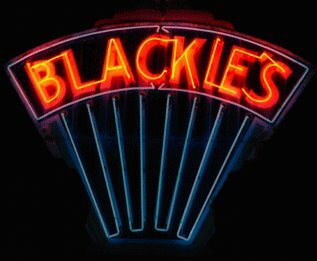 Coming up next-Blackies Hotdog Stand exists as a time warp and treasured restaurant in Cheshire. Will it live up to its reputation? Stay tuned! Did you know? We also tutor. Click here to check out NimbleFox, our tutoring website!